Luxurious G. Lalo stationery is the perfect canvas for expressing your sentiments in a memorable way. Elegantly understated, it speaks for itself with a deckled edge, heavy card stock, and a laid paper finish. 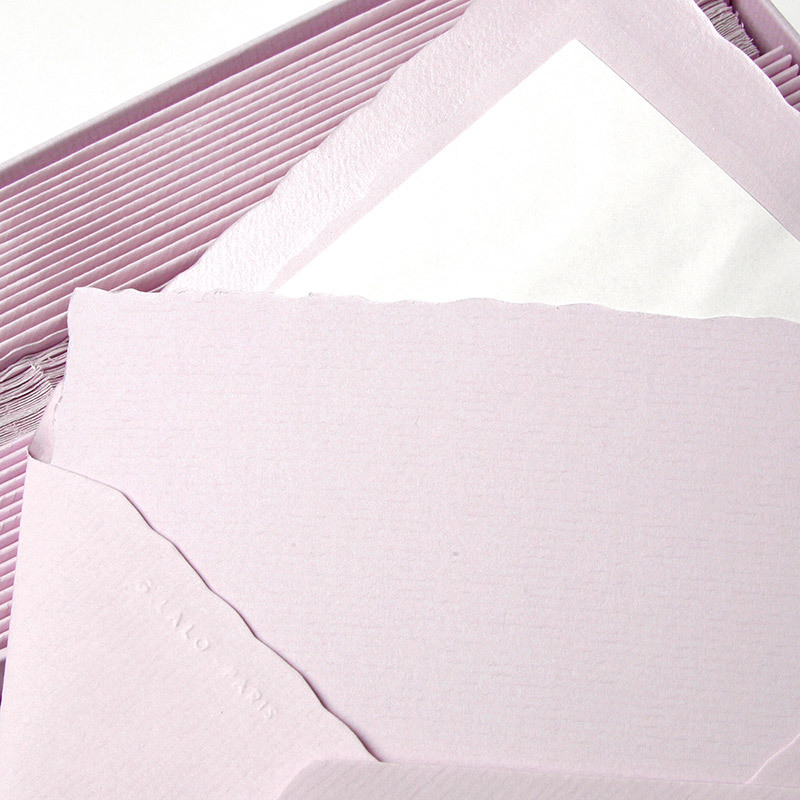 These wonderful flat cards include elegant matching color, tissue-lined envelopes. Choose from an array of colors, all presented in a lovely gold embossed gift box in matching color. Great for blinging out your home or office decor, and as such, a great gift too! Originating in Paris in 1919, G. Lalo quickly rose to be de rigueur for social stationery in Paris and in the royal courts across Europe. Throughout the years, the elegance and quality of G. Lalo stationery lends it to be the first choice when pleasure or etiquette require the best in matters of correspondence, invitation, or simply, writing. G. Lalo, the Parisian social stationery manufacturer since 1919, became throughout the years the stationery of reference both in Paris' high society and in the royal courts of Europe such as Sweden, Holland, Monaco and Belgium. Today, G. Lalo continues its tradition of handcrafted quality and elegance but expressed with the colors and excitement of the 21st century. Luxurious G. Lalo stationery is the perfect canvas for expressing your sentiments in a memorable way. I have used these for years and love them. They are always beautiful. These papers are really lovely. I bought a pink and a yellow pack years ago and have been very discriminating about who I use them on. I was delighted to find that I can buy more and there are more colors. 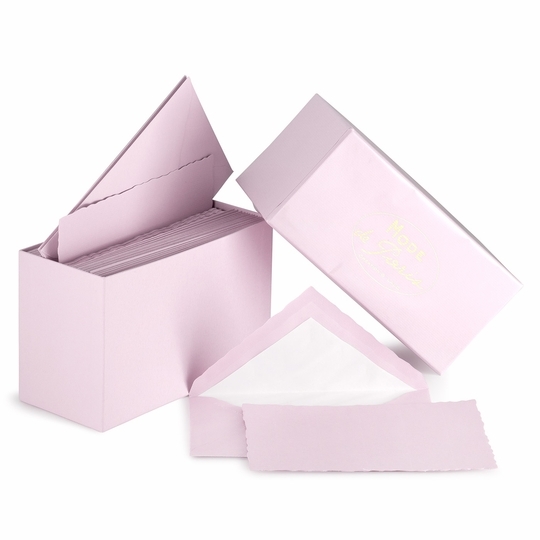 This box set is the perfect thing to have on hand to jot a quick thank you note. The quality of the paper and envelopes is very good. ProsEverything you need in one box. Fantastic quality of paper. Very good price. These cards did not disappoint, fulfilling every expectation of G. Lalo Mode de Paris stationery. This was my first Vickerey shopping experience and it could not have been better - from site to packaging and delivery. ConsSize was slightly smaller than expected, but measurements were acurate. absolutely love the note cards with matching envelopes. Love the scent too! High quality paper, lovely box, nicely packed�€”i want blue next! A way to make everyday thank yous very special indeed. My favorite stationery for over twenty years. So pleased Vickery carries this line. Excellent communication with Vickery, great transaction. Will be ordering G. Lalo stationery from them again. Thank you. Quality and shipping were top notch. Highly recommend! The card is darker than shown in pictures. Fabulous product with next day delivery! I can count on Vickerey to provide outstanding products with excellent customer service. In the mad rush to make last minute Christmas gift decisions, I chose the G. Lalo boxed stationery as my "go-to" gifts. The price was reasonable, so I purchased multiples in a variety of colors. It made the gift getters very happy and is a classic gift for my gift closet...all year around!!! The stationery arrived very quickly and was exactly as advertised. ProsFantastic price and great customer service. I have used these note cards for over 10 years. They are just the right size and everyone loves to receive them as they are so different. ProsRight size, wonderful paper texture (I use a fountain pen), and they are elegant.